Everton produced a fantastic performance and were within minutes of securing a vital away win over Tottenham Hotspur, but ultimately were forced to settle for a point as the Champions League eliminator ended in stalemate. All the talk pre-match was of the players missing through injury and suspension, yet Everton and Spurs shuck off the absence of Pienaar, Fellaini, Bale and Lennon to produce a thrilling Premier League encounter. Spurs took the lead inside the first minutes, Adebayor poking home Vertonghen’s cross with just 34 seconds on the clock. Everton responded superbly, and were level just after the 15 minute mark when Jagielka converted a corner at the far post. The moment of the match arrived 10 minutes into the second half, Kevin Mirallas using his pace to seize onto a pass from Anichebe, before jinking past 3 Spurs players and firing a shot low into the far corner past a despairing Lloris in the Tottenham goal. With the clock ticking down, Everton looked like they might be able to hold out, only for a Adebayor shot to strike the post and the ball fell perfectly for Sigurdsson to prod home an equaliser. Everton almost won the match in injury time, when the brilliant Anichebe latching onto a Jelavic flick-on, only for Lloris to deny the Nigerian with an expert block. So where does all this leave Everton in terms of Champions League or Europa League qualification? In truth, this has done little to the overall picture. A win, as explained by David Moyes in his post match interviews, would have propelled the Blues right into the middle of the mix, but for now, we remain just outside the main three contenders. This may yet be a blessing in disguise, with the pressure and media attention focused on the three clubs from London, allowing Everton to quietly go about their business, picking up victories to secure the much coveted European football. The Blues must ensure a maximum return from the three remaining home fixtures and then win as many of the remaining away games as possible. The stand out fixture is the re-arranged tie at The Emirates. Three points in that fixture would put Everton within a win of both Spurs and Arsenal and with Tottenham having difficult games at Manchester City and Chelsea still to play, it will in all likelihood remain undecided until the final day of the season in May. In truth, this deserves a blog post of its own, but for now I will sum up the unimaginable improvements displayed by Victor Chinedu Anichebe in one paragraph. Yesterday, the brilliant Anichebe led the Everton line superbly, bullying England international Dawson into constant retreat. The Spurs defence struggled to cope with Anichebe all game, and the Nigerian is now showing the form that many thought him capable off when he first broke into the team as a raw 17-year-old in 2006. The glimpses of ability have developed into polished performances against some of English footballs premier teams. 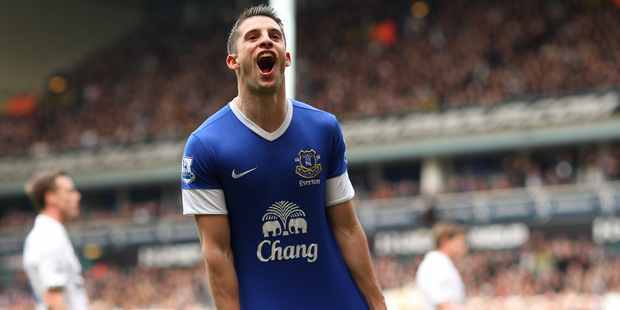 All that was missing from his game at White Hart Lane was the winning goal, which almost arrived in the dying moments. Anichebe powered away from Dawson and with only Lloris to beat, lifted the ball up and towards the Spurs net, only for the French keeper to lift a leg to block the goal bound shot. Deservedly Everton’s first choice centre forward, Anichebe will be looking to finish the season with a flourish.